Otomicroscopy is a process whereby the inner ear is examined using an otomicroscope. Basically, during the examination, you have two options as a patient. One is with cerumen removal and another is without. Whether cerumen removal is recommended or not with otomicroscopy, you have to take note that there should be little to no complain of discomfort. Surgeons, however, may discuss with you the following post-operative care instructions after undergoing one. Basically, otomicroscopy is used in order to examine the conditions of your inner ear, with the clinician pointing out whether there is a need for treatment or not. Since it is actually a non-invasive procedure, expect that there can be no necessary recommendations as to what medicine you should take in. It will be good to discuss this stuff with your clinician. Ask if there are vitamins you can take in to prevent cerumen build-up. Your doctor will prescribe an ear drop that can help soften ear wax. There are cases though that prescription will not be needed when buying one. But for the purpose of making sure you will buy the correct medicine and that you will be able to use it accordingly, asking for a prescription will be recommended. Ear drops may come with specific instructions too. It is important to warm the drops before putting a drop or two on each ear. You simply need to hold the bottle with your closed palms for a few minutes to keep it warm and prevent you from feeling dizzy once you use it. Lie down in such a way that the affected ear is facing up. You may choose to seat or stand with the head tilted on the unaffected side. Pull your earlobe then place the appropriate number of drops needed. Allow the ear drops to work by making sure the affected ear faces up. Wait about 5 minutes to allow the drops to coat the ear canal’s outer part. From there, you can clean your ear using a cotton swab. The very reason behind why people have to undergo otomicroscopy is to have a closer look as to how intense the cerumen buildup can be on the ear. Many times, school physicians will check your child which includes an inspection of the nails, eyes, and ears among others. When the physician includes cerumen buildup in the assessment then the next thing you should do is go to an otolaryngologist who will help gauge the intensity of the condition. Generally, however, the one thing you will be reminded to do is to clean your ears as often as needed. Take note that cleaning the ears should not be done excessively as this can destroy the eardrum which may lead to another problem later on. 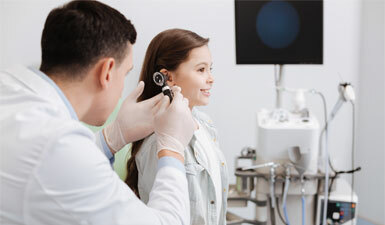 Visiting an expert to check on your ears after you have sought treatment will be your best defense against possibilities of severe ear blockages. Make sure you set an appointment with your healthcare provider or at least follow the instructions as to when you should come back for your checkup.